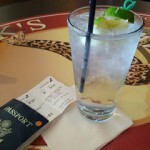 Travel isn’t all about fun and games for me. 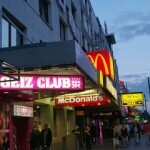 While I do believe in cutting loose and enjoying myself, as I had done a earlier in Hamburg, I don’t shy away from visiting those places or seeing those sites that might make others uncomfortable. 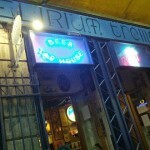 It’s different from the travel philosophy of some other backpackers I’ve met along the road — ones that are on holiday and only concerned with drinking and partying. Visiting a place like Neuengamme is a somber event, but I believe it is important to see these places so that we don’t lose sight of what’s happened in our history. 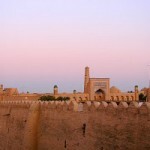 Part of traveling for me is about enriching my experience and seeing history. You may not have had any relatives who fought in the war, or were put in any camps, but this was an event that has ingrained itself in our shared human history and it’s important to see a reminder of what can happen when emotions such as nationalism, prejudice, and hate run amok. Neuengamme lies outside of Hamburg, in the southern borough known as Bergedorf. It’s not the easiest place to get to, and you’ll definitely feel that you’re leaving Hamburg and heading into the ‘burbs. You’ll want to take the S-bahn from Hamburg to Bergedorf. 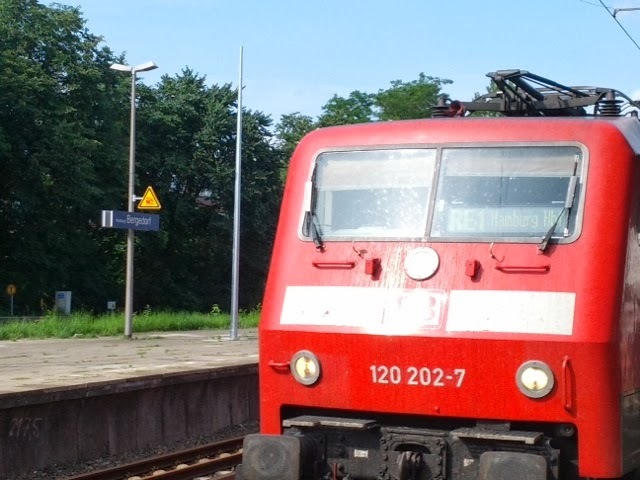 When you’re at the Bergedorf station, you’ll take the bus #227. It’ll wind through the countryside for a while, doing a large loop, and eventually one of the stops on the country road will be right in front of Neuengamme. I didn’t find that any of the bus drivers spoke English that well (thankfully I still recalled a fair bit of German from high school), and aside from Louise, there were no other backpackers. Be prepared for a minorly-difficult trip compared to reaching other destinations anywhere in Germany… which isn’t saying much, considering Germany is probably one of the easiest to travel and most accessible countries I’ve been in. 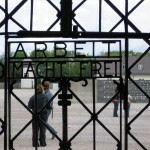 The Entrance gates to Neuengamme. It is gigantic, quiet, and you can just feel the weight of the place. Neuengamme is large. Very large. It was built on the site of a former industrial brickworks that had been purchased by the German Earth & Stone Works company (an SS-owned company dedicated to the production of manufacturing products for the war effort) in 1938. Initially, it was small, and set up with just 100 prisoners from a nearby concentration camp. But, in 1940, things expanded greatly, as the SS and the City of Hamburg signed an agreement for the establishment of a larger factory. At that point, Neuengamme expanded and became a main camp. It would eventually expand to include more than 80 subcamps spread throughout Hamburg. Its operating policy: extermination through labor. Neuengamme would go on to house more than 100,000 prisoners and become the largest camp in northern Germany. More than 42,000 individuals would be murdered at the camp, though it’s likely thousands more were victims, as a number of records were destroyed towards the end of the war. Records on the camp are spotty, and it’s estimated that more than ten thousand died in evacuations that took place in the final weeks the camp was opened. Ruins/Foundations of the main barracks. The main courtyard is huge. And empty. We didn’t see a single other traveler or tourist in the entire courtyard. It gave things an incredibly ominous feeling. Most of the buildings were simply prisoner’s barracks, however a few were set up for other purposes. A plaque at the base of one of the foundations described how the building was used for medical experimentation. Neuengamme was a center for experimentation on Typhus, Tuberculosis, and water-borne contamination. One of the plaques described the heartbreaking situation of 20 Jewish children brought in from Auschwitz specifically for the purpose of medical experimentation involving Tuberculosis. They suffered for 3 years at the camp, and then were murdered at the end of the war (along with their caretakers) in order to cover up the evidence of the experiments. 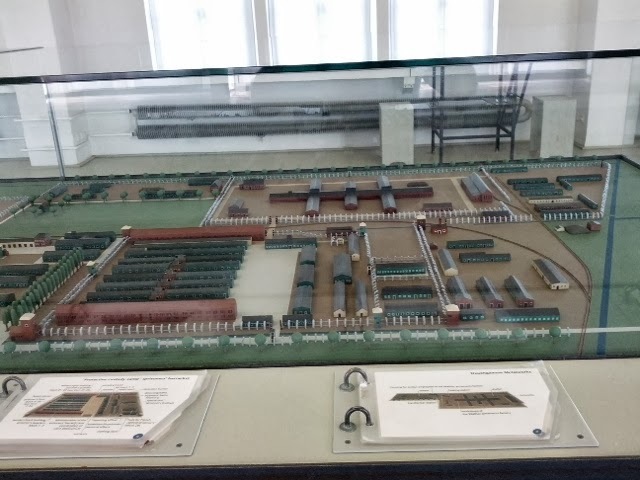 A model of the main courtyard and housing structures of the camp. 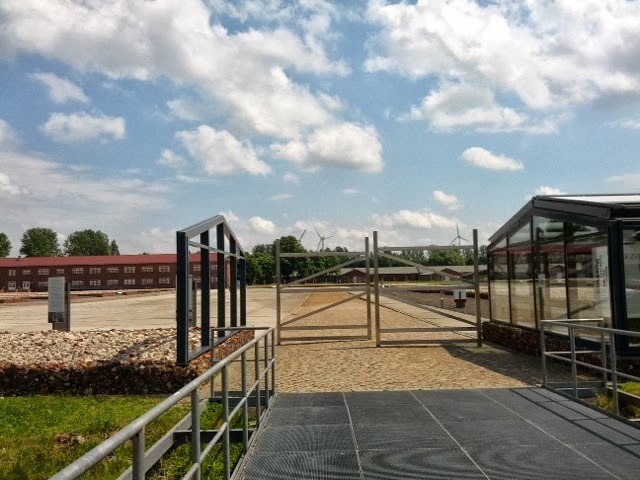 There are several buildings throughout Neuengamme that are preserved as exhibits about the overall camp and about the lives of the prisoners. 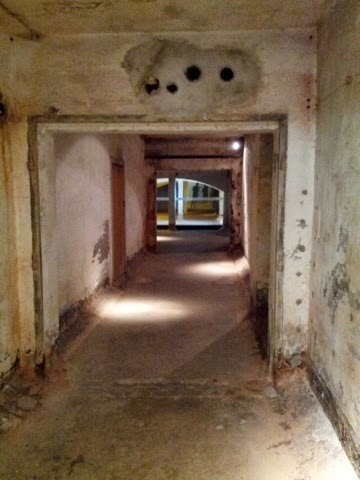 In one building, you’ll see some of the tools and exhibits on the work that the prisoners were forced into at the camp. Another is dedicated to explaining the camp as a whole and giving insight into the daily lives of the prisoners there, as well as who they were before they were imprisoned. You’ll see recordbooks documenting the names, ethnicities, and other basic information about the prisoners who were taken in. You’ll see their cots, their prison clothes, you’ll see the different symbols prisoners were forced to wear (such as the Jewish star), and you’ll see videotaped survivor interviews. It’s heavy, intense stuff. I don’t recall saying more than a sentence or two the entire time I was going through the different exhibits. The patch the Jewish prisoners were forced to wear. Though only several hundred jews were imprisoned in Neuengamme. Most prisoners were Soviets and other POW’s, both internal and external. We found our way into the basement of one of the buildings. A prison, maybe? Caption: Eric Macleurin, beside a pile of shoes; the owners were all murdered. What was most striking to me is that Neuengamme continued to be a prison well after the war. For the first few years it was used as first a Russian Displaced Persons camp, and then a camp for the German prisoners of war. In 1948 the camp was turned over by the British forces to Hamburg, where it was then converted into a prison. It continued to operate as a prison, with use of some of the original structures, until 2006, when the entire grounds were turned over to be a memorial. Now, up until then, part of the grounds had been used as a memorial, but it still blows my mind that individuals would be imprisoned at a site that was once a concentration camp. Even if they were treated just fine, to me, it doesn’t feel right to make continuing use of grounds that were put to such evil purposes. In any case, we left Neuengamme humbled and haunted by the sights of humanity at it’s worst and most terrible. Though it is not an easy experience, it is one that I recommend to all travellers and backpackers in the area — there’s no entrance fee to get in, and it will provide you with memories and experiences to last a lifetime. I’d like to close with a question to you fellow backpackers and travelers: what are some of the most haunting or humbling sites you’ve seen on your travels?